A modern interpretation of the traditional dogtrot home, Camp Baird comprises two cabins placed along an L-shaped orientation. An elongated, solar-heated lap pool runs the length of the south-facing side, alongside an expansive ipe deck that measures nearly 1,600 squarefeet. The lounge chairs are by Loll Designs. Though the home includes a full bathroom, the Bairds primarily use the outdoor shower for bathing; the fixture is from Signature Hardware. An acolyte of Bay Region Style—a genre famously coined by architecture critic Lewis Mumford to characterize a uniquely humane form of regional California modernism—Davis looked to iconic projects of the past, including Bernard Maybeck’s 1911 open-porch Temple of Wings, and William Wurster’s now-defunct 1938 Greenhill Ranch on Mount Diablo, for ideas. In the end, a nearby dogtrot cabin by Davis’s mentors, William Turnbull and Mary Griffin, who have described it as a “landscape design with occasional rooms in case of rain,” became the clearest model for the new Camp Baird. Inspired by the sound of nearby water, which “makes the whole site compelling,” says Davis, he devised a design that places a slender, 82-foot-long, solar-heated swimming pool at the heart of the structure. It’s flanked by nearly 1,600 square feet of ipe wood decks on its east and north sides, and two large expanses of grass at the east and west ends—all apt for lounging, playing lawn games, or pitching tents. A board-formed concrete outdoor fireplace used for grilling and cooking, and a partially screened outdoor shower are also situated poolside, providing elegant and convenient, no-frills campground amenities. Naturalistic drought-resistant native plantings by landscape architect Cary Bush of Merge Studio help soften the surrounding area that is ringed by a 30-inch high, step-over corrugated Cor-Ten fence, which deters unwelcome rattlesnakes. For more effective shelter from the elements—the scorching sun, coastal fog, and rain that frequents the area—Davis devised two rectilinear dogtrot structures. 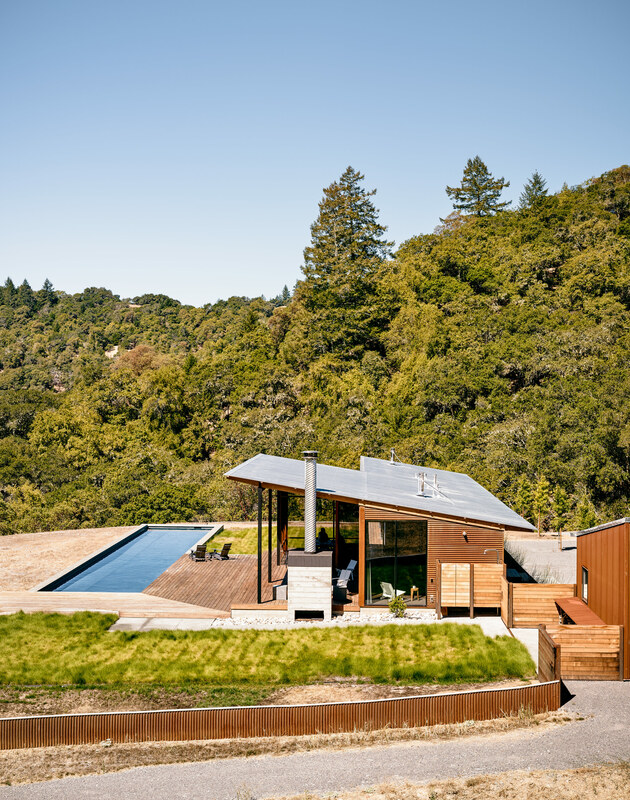 Each one was carefully crafted by Fairweather & Associates from low-maintenance and wildfire-resistant materials: concrete slabs for the flooring; corrugated Cor-Ten steel that blends into the landscape, for exterior cladding; and heat-reflecting, galvanized corrugated metal for the roofs. Laid in an L–shaped plan on the north side of the pool, the two buildings form an entry courtyard large enough for fire trucks to turn into (a local county requirement). The smaller of the two dogtrot structures—a prefabricated car-and-tool barn with an all-metal frame—doubles as a drive-through portal that extends from the courtyard and into the landscape beyond. The larger dogtrot is a custom cabin with a roof (screwed on to exposed wood-and-steel framing) that contains fully enclosed rooms on a concrete slab floor, covered with wall-to-wall floor coverings by Chilewich and outfitted with a central breezeway. At each end of the breezeway, swinging doors made of slender ipe wood frames inset with fiberglass mesh screens allow cross-ventilation yet keep bugs out. On the east side of the breezeway are one large room and a half-bathroom; on the west side of the breezeway, the enclosed area contains two smaller rooms, a bathroom and food storage spaces. Intended in part as yoga and exercise spaces, the three main rooms—kept deliberately spare and monastic so tents and sleeping bags can be dragged indoors if the weather turns—have rollaway Fleetwood barn doors that open to the poolside porch outfitted with a commercial-style galley kitchen and dining area. “We are not connected to the grid at all,” says Jeff, proudly. The non-air-conditioned house is cooled naturally and heated by two wood-burning Rais stoves when the weather gets cold. All other lights, ceiling fans, water heaters, and the kitchen run either on solar power from an array of three stanchions with nine solar panels installed on a distant hill, or from a propane-fueled backup generator.